I’m constantly working on maintaining and improving BuddyPress, WordPress, and a stable of free WordPress plugins. Most of the time, I don’t single out that work for a blog post. But a set of recent updates to the illustrious Anthologize is worth a mention. You may remember Anthologize as a project that grew out of the original One Week | One Tool project back in (gasp) 2010. The OWOT team maintained the tool, a WP plugin for generating ebooks from WordPress content, off and on through the months and years following the initial release. Since then, I’ve tried to keep it minimally up to date with the latest versions of WordPress and PHP, knowing that there was a small community of folks for whom Anthologize was an important part of their workflow. Massive accessibility improvements throughout, including a rewrite of much of the admin interface to better match WordPress’s. 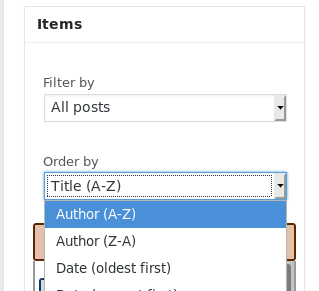 New search and filter tools on the Project Organizer’s sidebar, including an Order By option and expandable metadata for each item. The ability to include post date and post author in PDF exports. These new features, originally developed for the OpenLab, are part of the Anthologize 0.8.0, available now. This project is a great example of how an institution can take an interest in what might otherwise become a moribund piece of software and, by partnering with a free-software-oriented consultant like Hard G, can create tools that benefit themselves in addition to a larger community of users. Thanks City Tech and Hard G for sharing the improvements.